New England is an endless white-out blizzard. My spectacularly aquatic friend, The Swimmer, calls and begs me to accompany her to the Island of Nevis in the West Indies. I look outside at the swirling drifts of Maine snow and do not hesitate. YES, I say, YES. 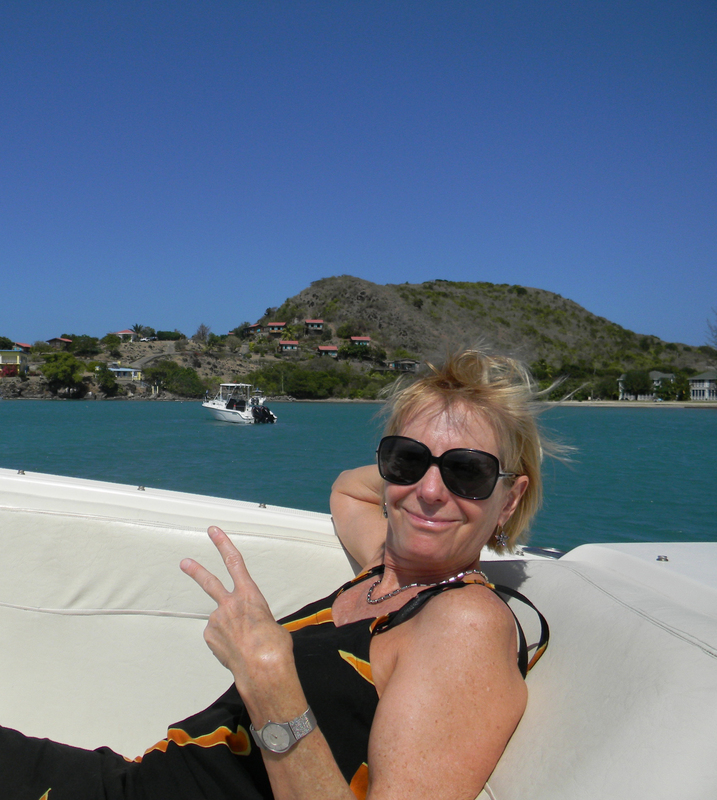 We land in the brilliant sun of St. Kitts and head for the water-taxi to Nevis. At Reggae Beach a sign reads, “Live de life, man.” We vow to try. A brave little boat ferries us across The Narrows in six wild minutes of whitecaps and spray. 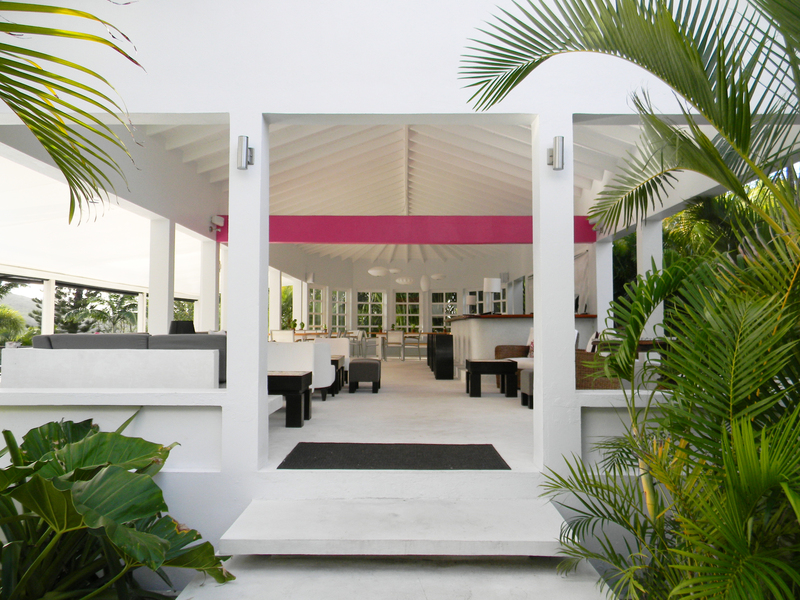 We anchor on Oalie Beach, pronounced “Wally” in Caribbean patois, and it’s utterly glorious. The sky changes from gray to blue to turquoise and back every few minutes — tropical special effects. On the occasionally hair-raising drive to our hotel we see sheep, goats and grayish brown monkeys with adorable black faces. Our driver says you can cuddle the little ones. Right. 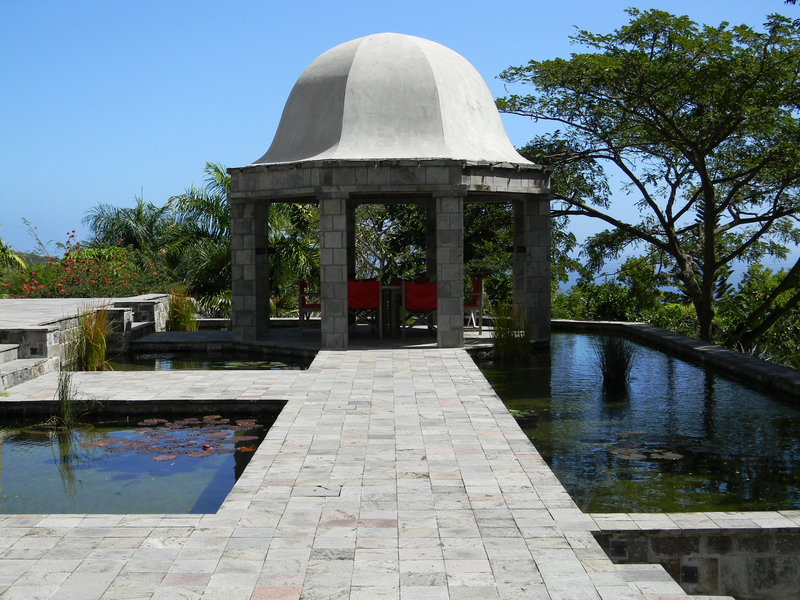 Way off the beaten track, Montpelier Plantation & Beach sits in a verdant tangle of lush greenery. Contemporary furnishings lend a relaxed, boho-chic ambiance. 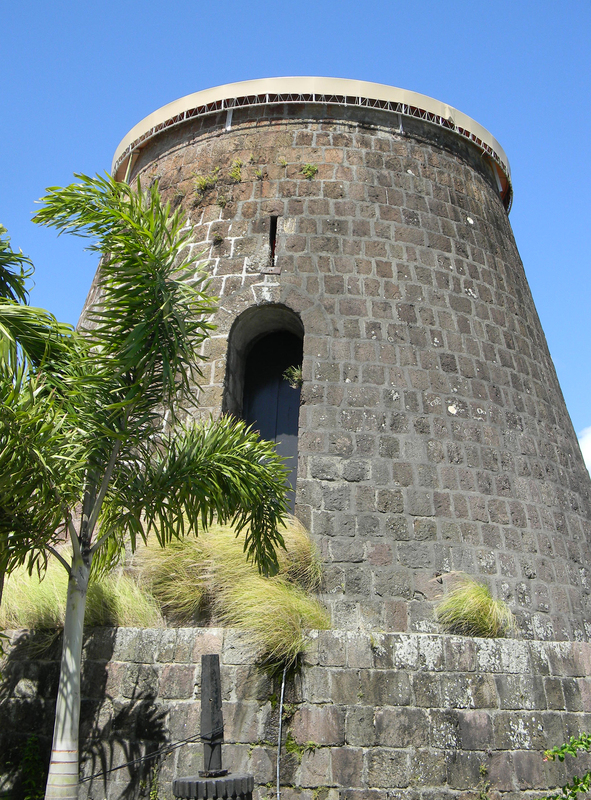 A tall, round windmill in ancient speckled stone is an imposing remnant Montpelier’s sugar-plantation history. The blades are long gone but the tower remains, now used for romantic candlelit suppers. Nice. I open the door to my secluded balcony, wonderfully private and shrouded in palm trees. The rustling green fronds make a lovely, papery sound in the steady warm wind. My first day in paradise. My mind uncurls like a New England fern. A rooster heralds my transformation. The morning heat is still soft and moist, like baby’s breath. In an hour it will be intolerable. There goes a tiny brown lizard, up the steps. I sip the welcome rum punch and get a hint of nutmeg. The Swimmer takes a sip or two and heads for the pool. She splashes like a Boston cod, breaking the glassy turquoise surface with long pale arms. I lounge in a chaise, poolside, and order a second rum punch. Everybody’s happy. 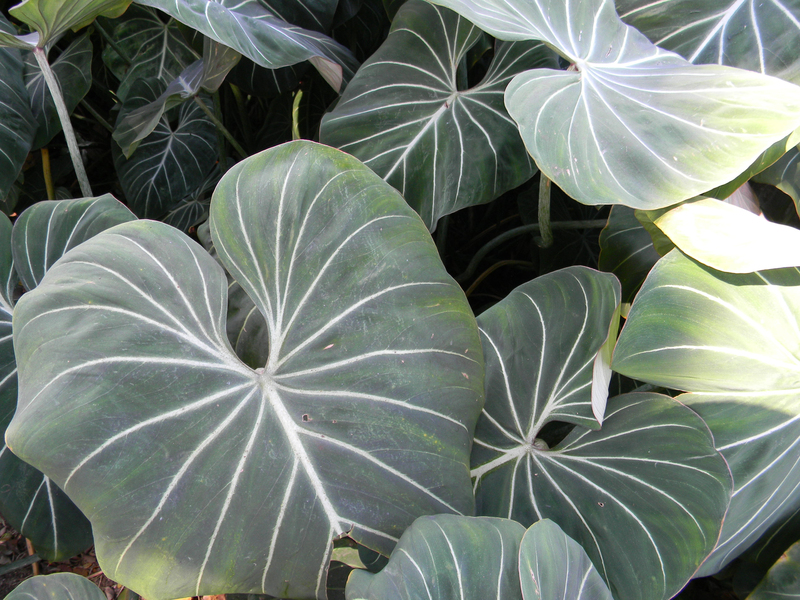 Ziggy the dog regards The Swimmer from a shady spot under a large leaf shaped like an elephant’s ear. Ziggy is part surfer and part golden retriever, an excellent combination, and I enjoy his floppy blond company. Amid all this lush teal and turquoise, it’s easy to forget that at the center of the island lies a sleeping volcano, Nevis Peak. Variously described as a sombrero, a hat and a hill, I know a volcano when I see one. 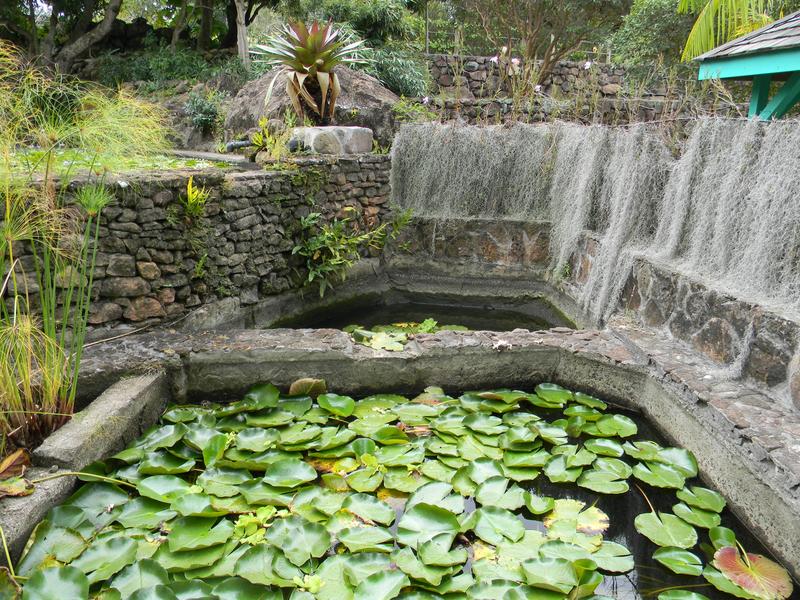 Especially when at its base it cradles a thermal spring, or “Bath,” used by natives and visitors alike. You can get anywhere you need to go on foot, by car or island taxi. 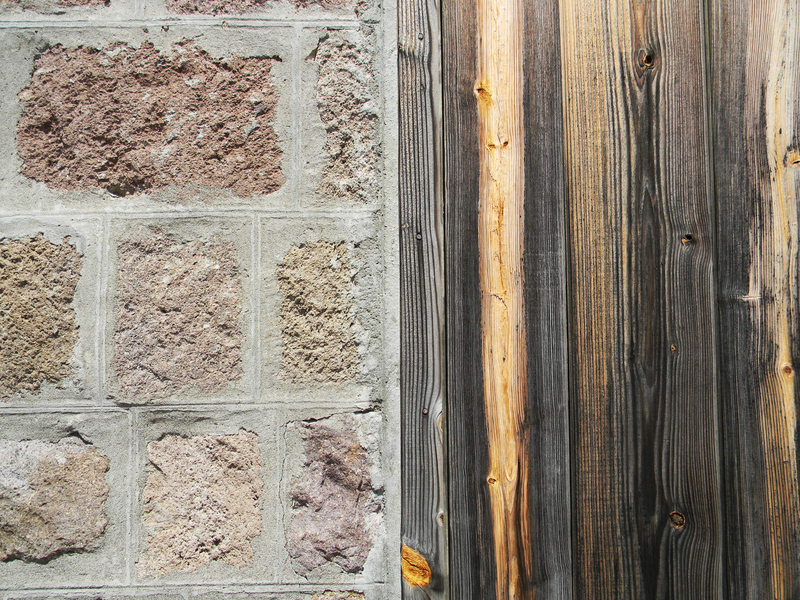 Check the price before getting in; island prices are fluid and can be confusing. 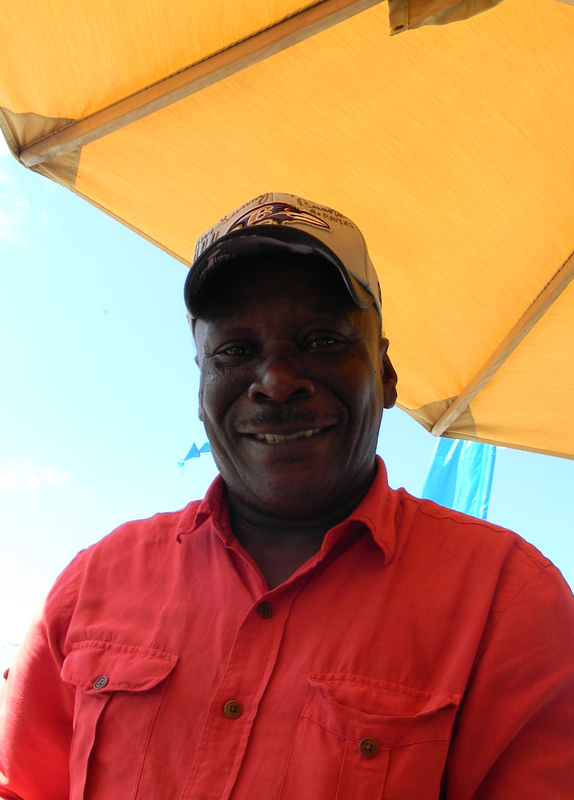 We indulge in a 3-hour tour of Nevis with “Champ,” unofficial mayor a.k.a. Alston Smithen. Champ knows everyone from Rastafarian farmers to fancy restaurateurs. His lilting West Indian accent almost takes our minds off the vertiginous sensation of “driving on the wrong side of the road,” which always takes a bit of getting used to. We hang on in true gonzo style and try to get our bearings. 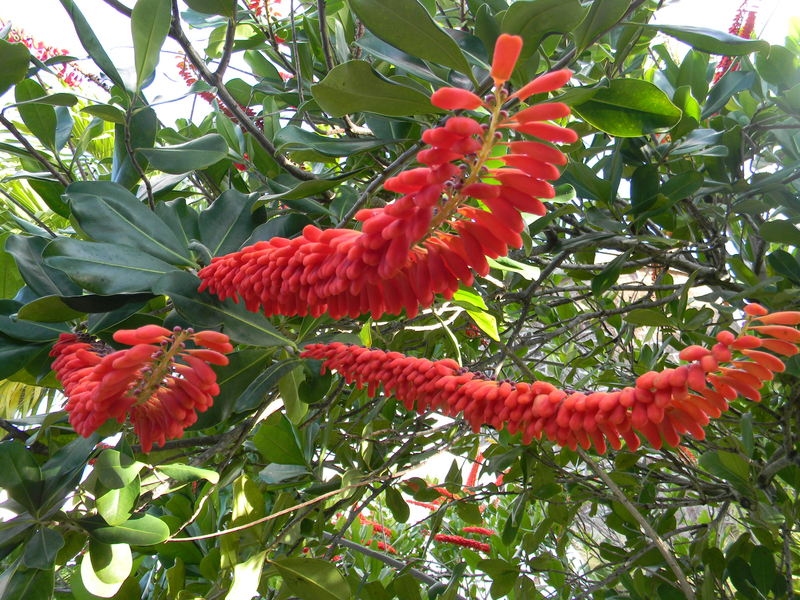 We drive through tiny seaside towns with uniformed schoolchildren and a bright pink primary school under red trumpet vines. We begin to relax as we pass several closely shorn sheep supervised by a snowy egret. The graceful white birds love the company of donkeys, goats or sheep, nature’s sweetest odd couple. Champ takes us up the steep rise to Golden Rock, an exquisite 100-acre estate and inn. The Swimmer knows all about the owner, minimalist painter Brice Marden. The Swimmer points out the casual, unfussy and glorious landscaping which took years and cost a fortune. Champ is impressed, “You know dem good, man,” he says. We visit New River Plantation, a sugar operation closed in 1956. 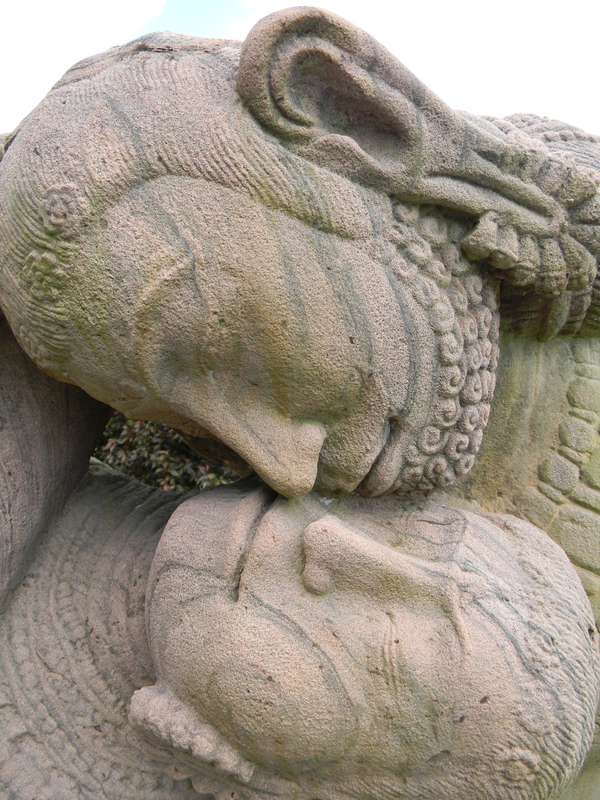 Part mausoleum and part sculpture garden, New River still harvests a little something now and then. 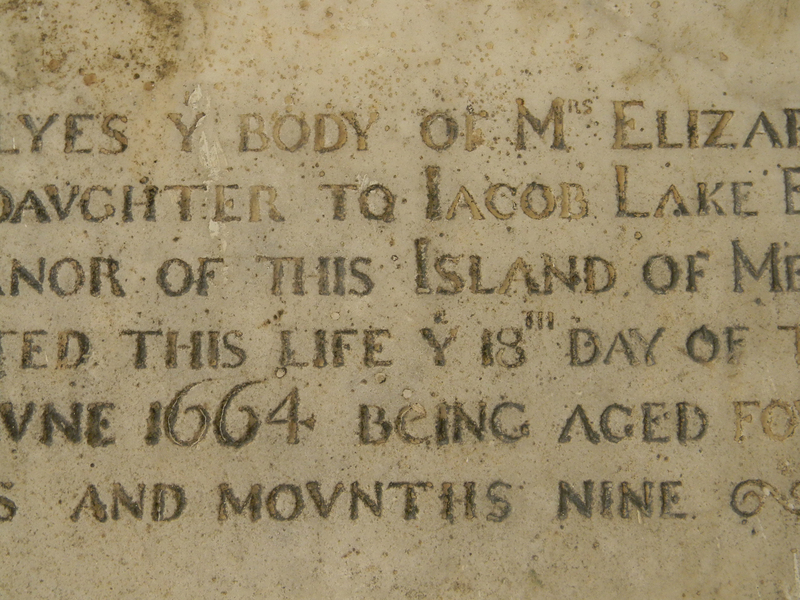 We continue to Nisbet Plantation, a wildly beachy expanse that, like much of the island, is freighted with history. Knowing how many people worked and died here teases my imagination to dark places. 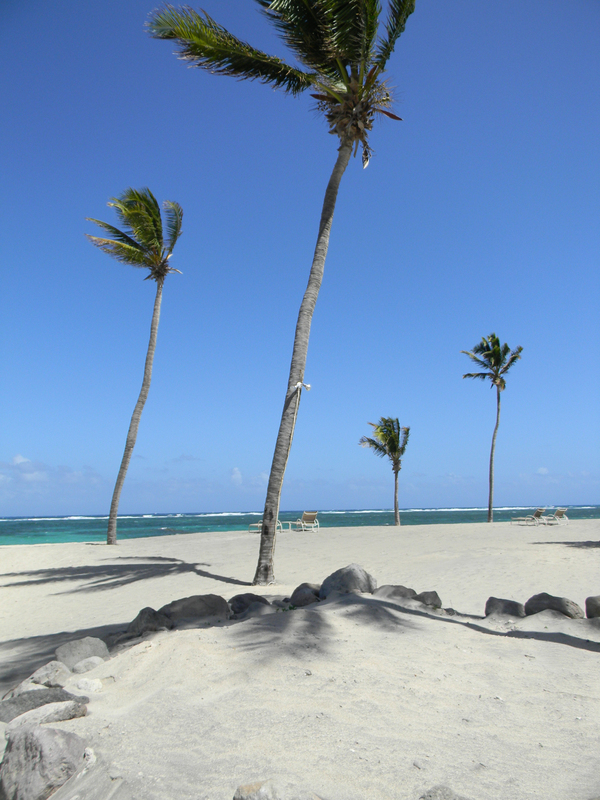 Visitors can help themselves to Nisbet’s sparkling expanse of sand and lose the remorse — all beaches in Nevis are public. 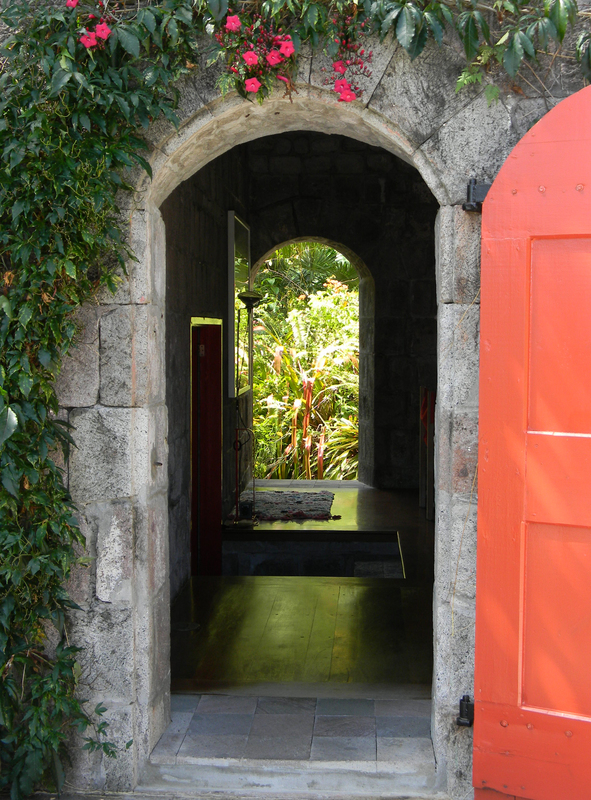 Our tour continues to St. Thomas’s Anglican church, the oldest in the region, dating back to 1643. The non-stop island contrast continues with a stop at the Four Seasons, the posh, safe and generic resort with 18 holes of golf and 196 rooms. The Swimmer says, “Four Seasons is on the beaten track.” Champ smiles. 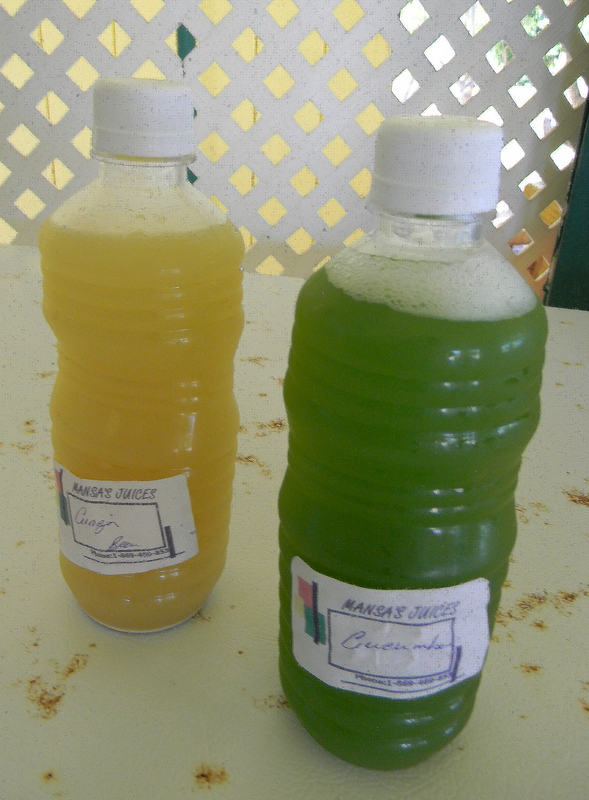 In the wilting midday heat we make our way to Manza’s organic farm for a taste of the extraordinary: cucumber juice, subtly sweet and astonishingly refreshing. 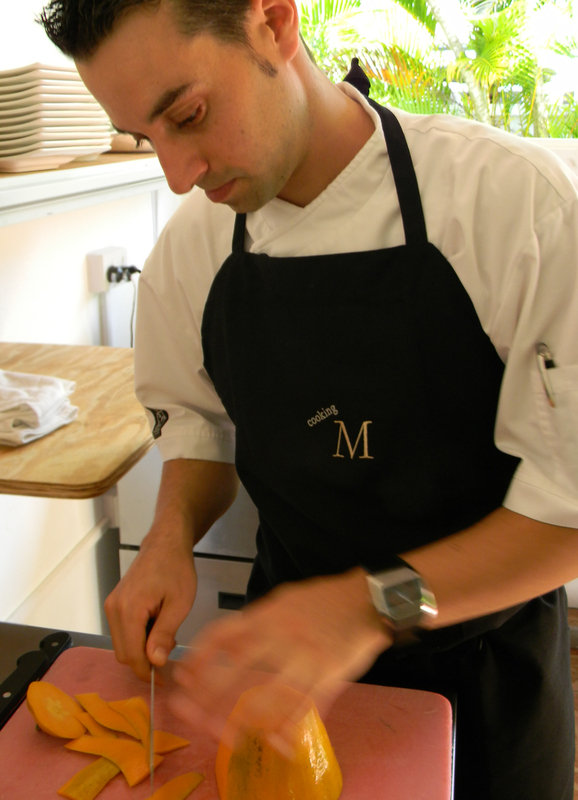 Manza tends his vegetables and fruits by hand with simple old-fashioned nurturing — it’s a beautiful thing, man. 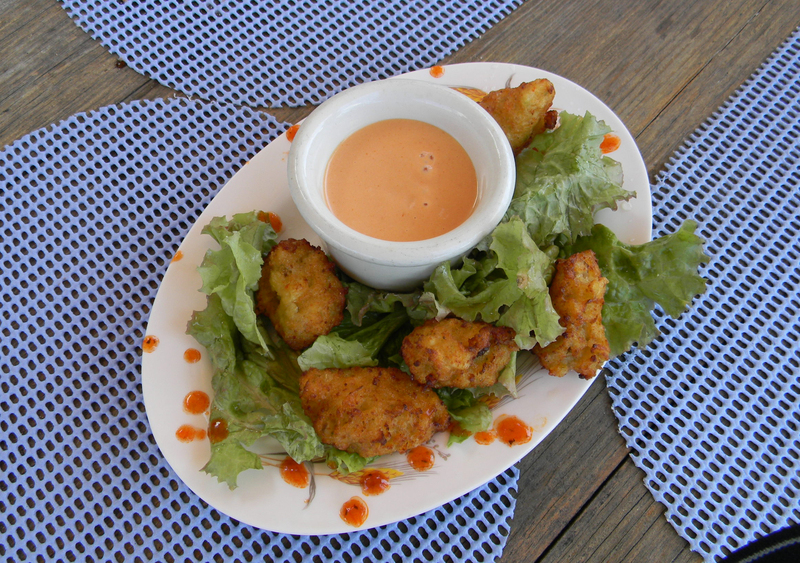 Saving the tastiest treat for last, we stop at Sunshine’s Bar and Grill for the legendary Killer Bee Rum Punch and conch fritters, with Sunshine’s own hot sauce — “a dream lunch on the beach,” says The Swimmer. 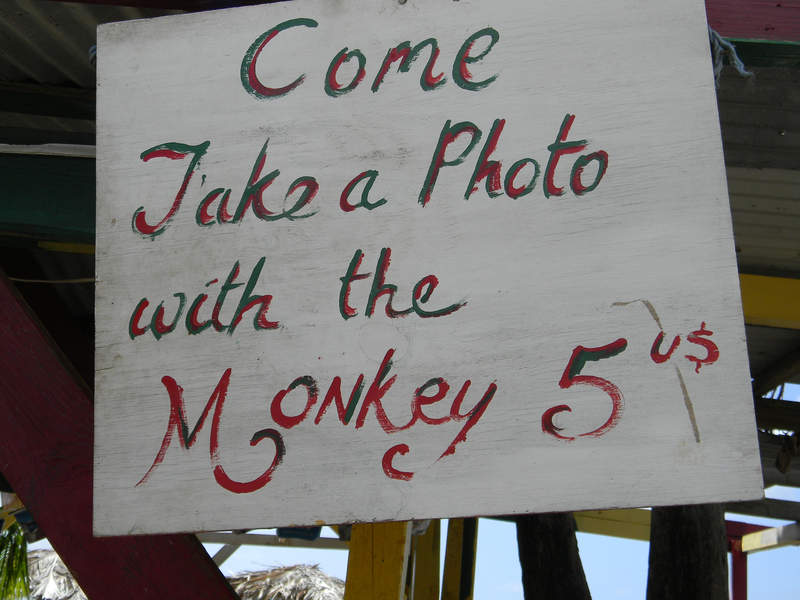 A fierce, beer-drinking monkey sits under a sign saying, “Pet the monkey, $5” — clearly depressed. 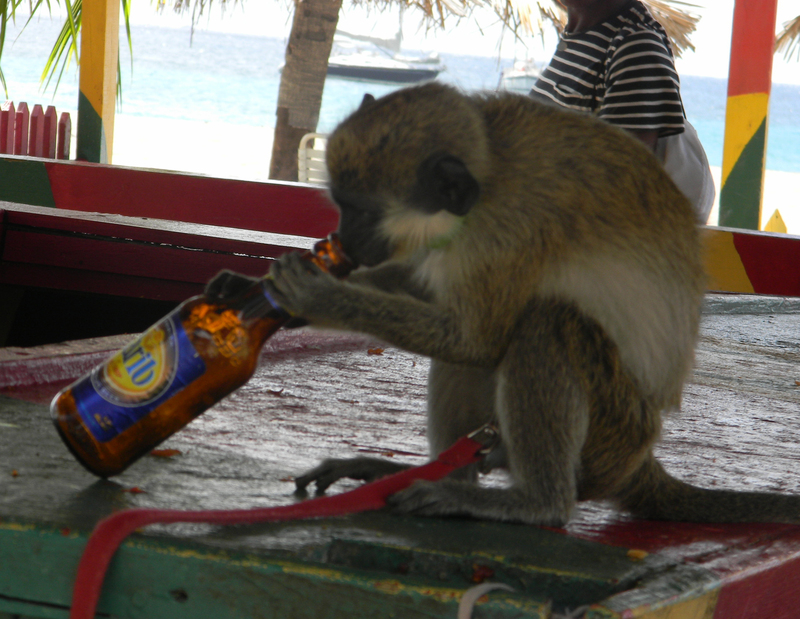 We joke with the guys cleaning fresh conch out back and forget about the miserable monkey. Another day in paradise. Breakfast is my favorite meal and Montpelier does not disappoint. Coconut breakfast bread is dense, sweet and almond-flavored, and resort regulars go straight for it. We are served cappuccino con mosca, “with flies,” a few whole coffee beans on the foamed milk. The morning landscape is lush and green, with stone arches framing a turquoise sky. I think maybe I am dreaming but see a frog, which reminds me that I am not. I would not include a frog in a dream of paradise. But I would definitely include cappucino con mosca. We indulge in a cooking class with French chef Ben Voisin who creates a meal of green cucumber gazpacho, island-style seared red snapper, lemony jasmine rice and fruit salsa. 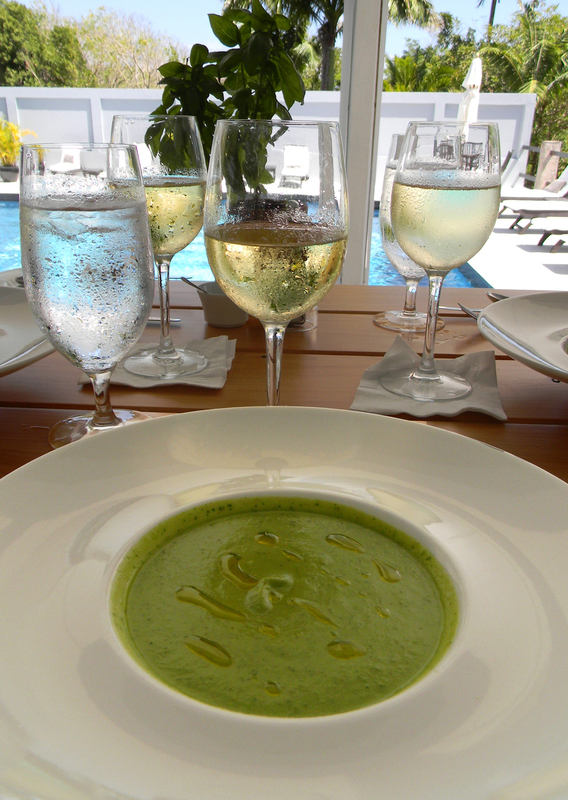 He is generous with his time and talent — and our lesson is followed by an exquisite poolside lunch. Hail to the chef! 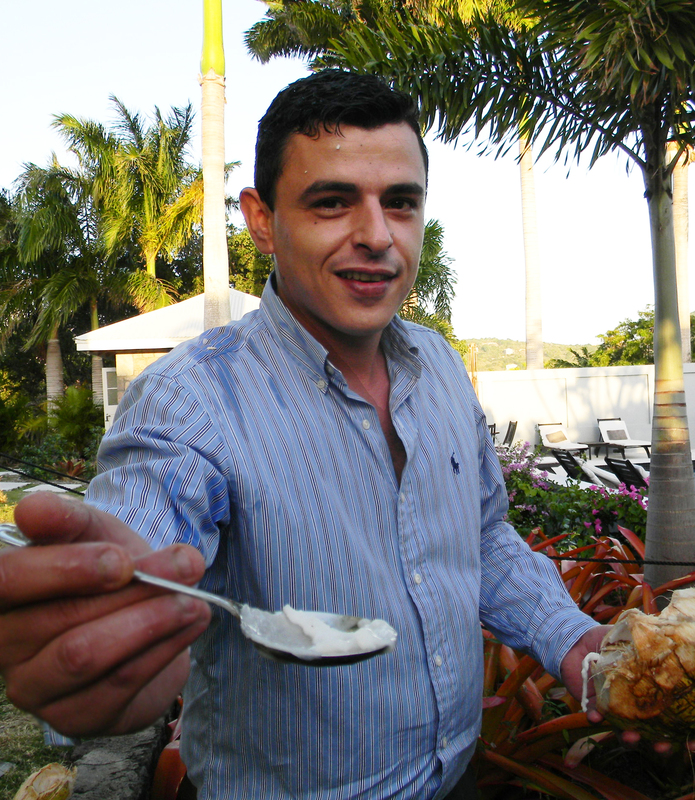 Afternoon tea, gin-heavy bar menu, tennis and other fine English traditions are part of the upscale West Indies vibe. 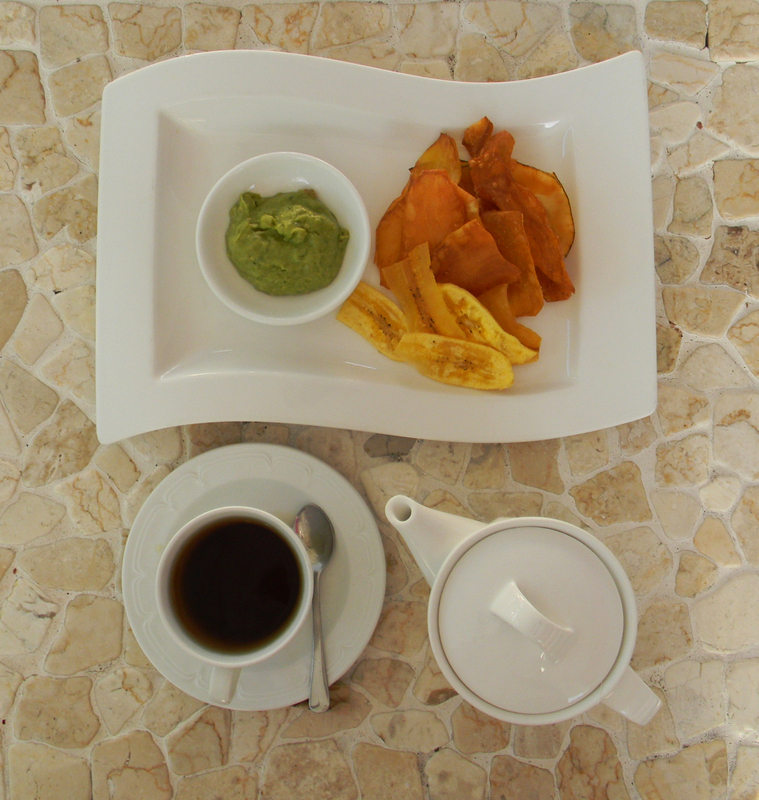 While Ziggy and I keep an eye on The Swimmer, I indulge in sweet-potato and plantain chips with guacamole, my kind of afternoon tea. 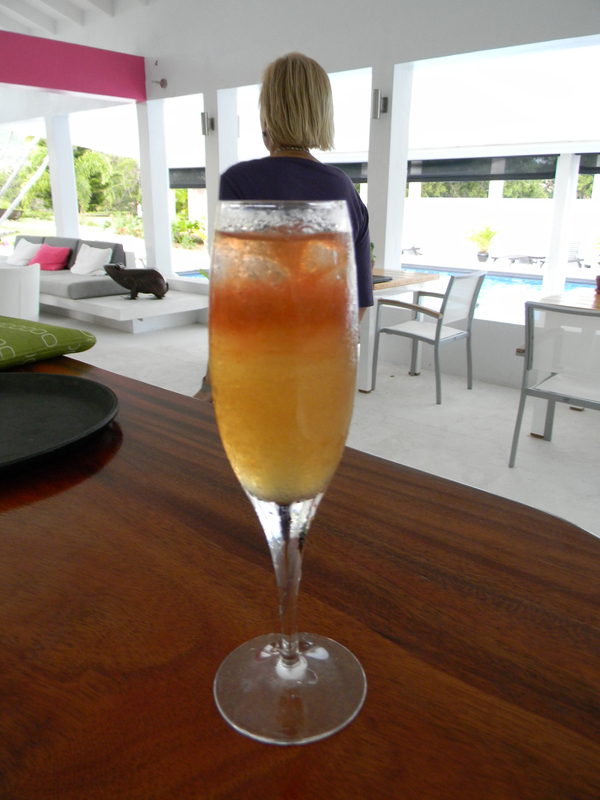 Intrigued by the island’s ubiquitous Rum Punch, we study with Montpelier’s award-winning mixologists. 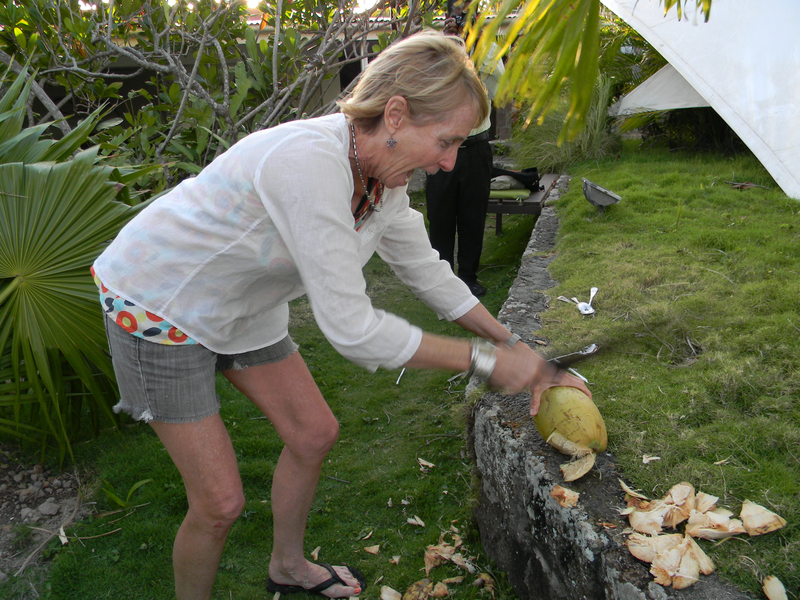 We whack away at a fresh coconut and taste the warm juice. We make Javier’s “Under The Sea” with bright blue curacao and dark rum, delicious. 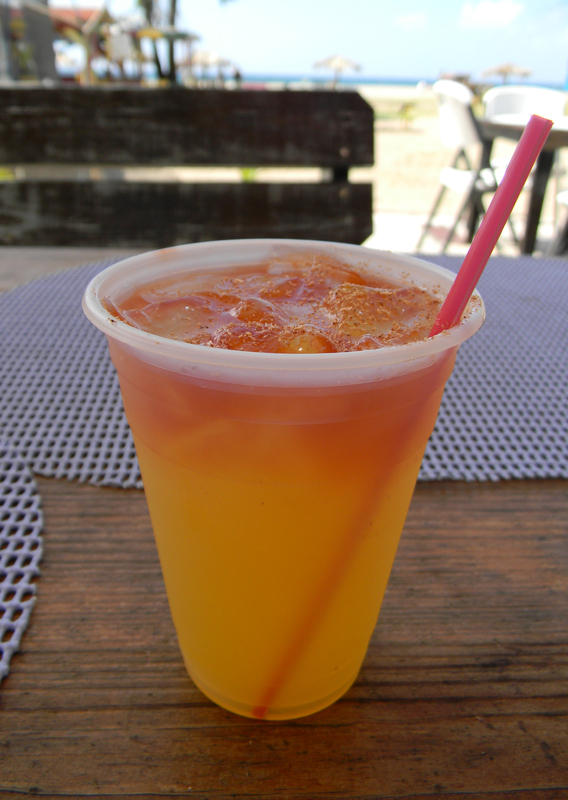 Nick’s “Coco Passion” has Coco Lopez, fresh passion fruit juice with seeds, two kinds of rum, and lots of creativity. The Pina Colada with fresh pineapple and fragrant nutmeg is heaven. 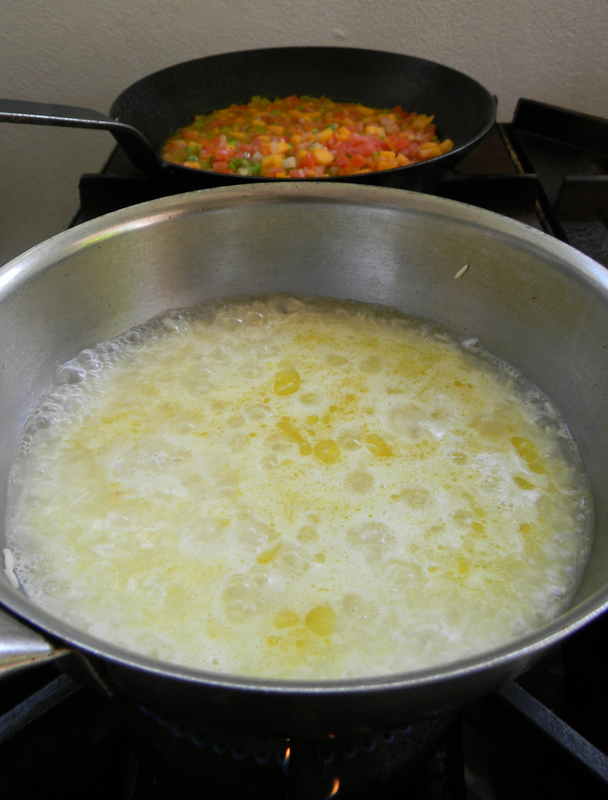 We never quite get to the Rum Punch recipe, but we no longer care. The stiff tropical breeze is up and clouds rush past Nevis Peak as if scrubbing it. 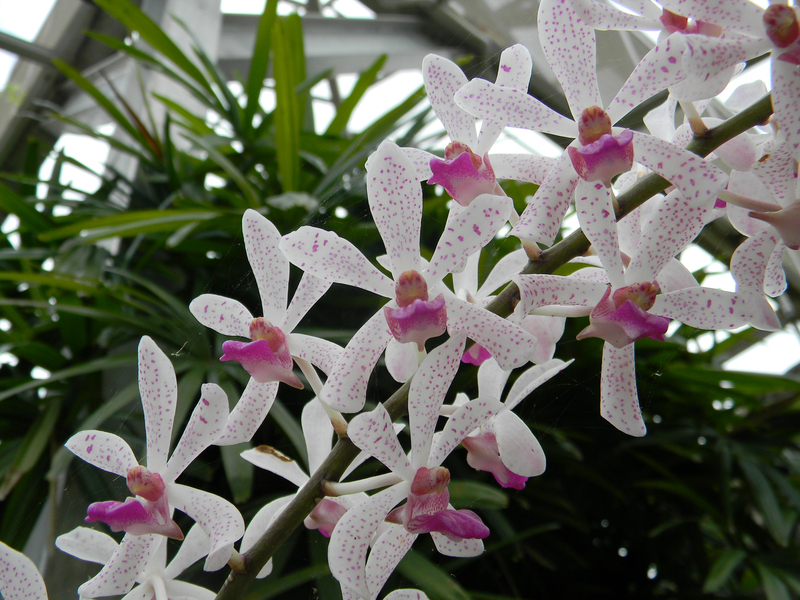 We wander down the road to Nevis Gardens, where orchids, vines, bromeliads, fragrant jasmine and gardenia flourish in formal restraint and informal chaos. Asian statues and fountains, a steamy greenhouse with bossy parrots, towering palms and cobalt sea views add to the heady green serenity. 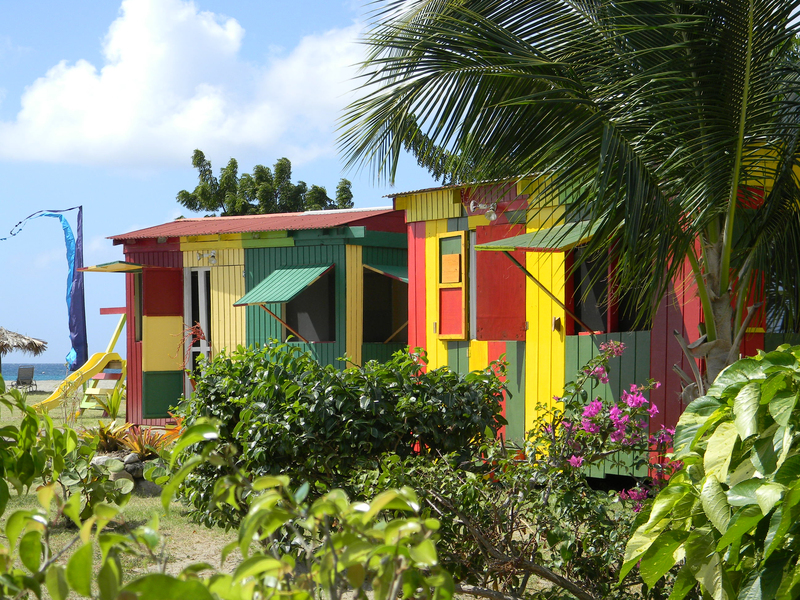 Reggae music, coconut groves and dreadlocks rule this wild blue Eden that lives on Island Time — there’s no rush in paradise. 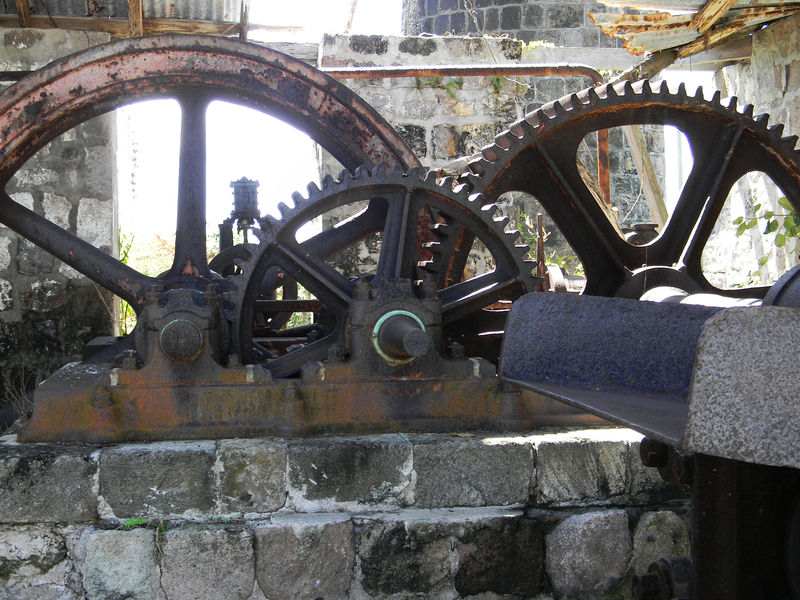 Nevis may be laid back, but it’s smart. The six-square-mile isle boasts a literacy rate of 98%, one of the highest in this hemisphere. This entry was posted in Food and Wine, International, Travel and tagged Benjamin Voisin, Caribbean, Gals Getaway, Javier Stanley, Maine, Montpelier Plantation, Narrows, Necee Regis, Nevis, New England, Nikolas Mantas, Poolside, Saint Kitts, Saint Kitts and Nevis, Swimmer, West Indies. Bookmark the permalink. Your posts are so clever and entertaining! 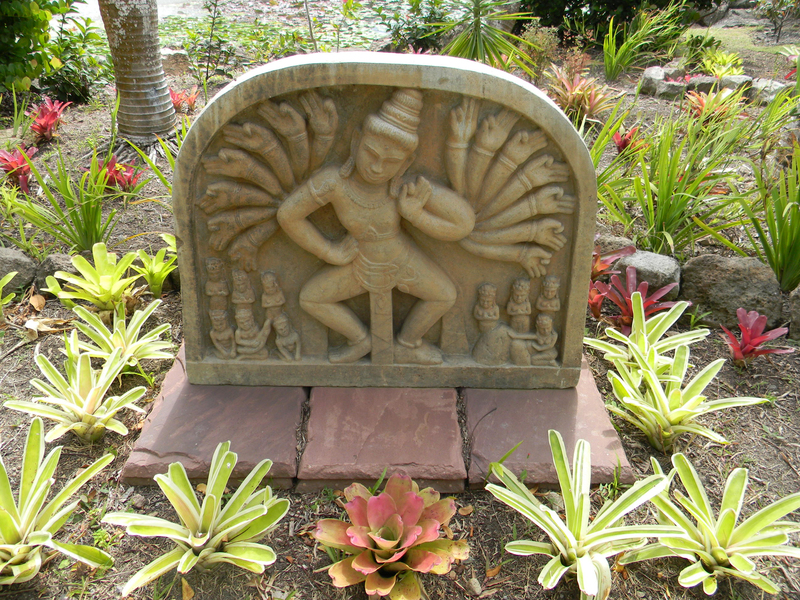 “I would not include a frog in a dream of paradise!” Thanks for a taking me there in your blog…. 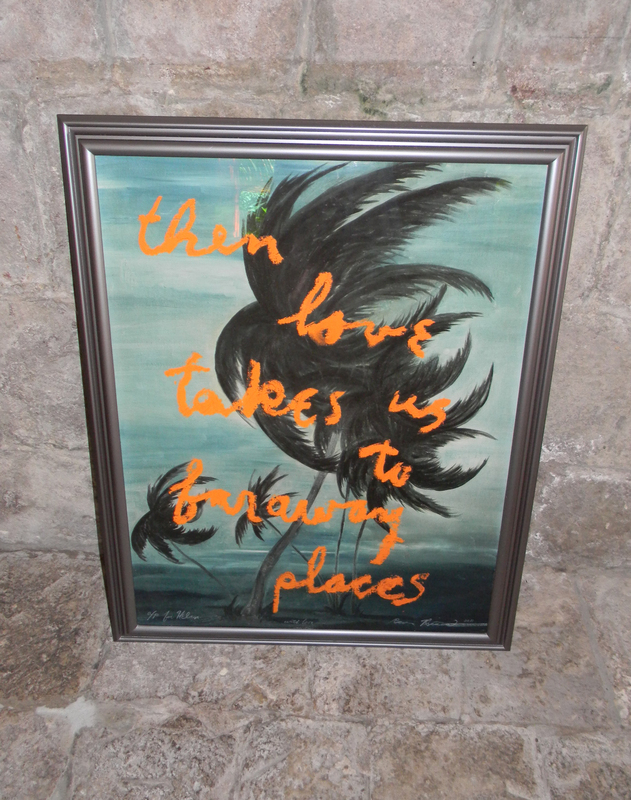 Thank you for this wonderful ‘tribute’ to a beautiful island paradise! It needs to be shared among all internet ‘travellers’. It is a small, but interesting & welcoming island. 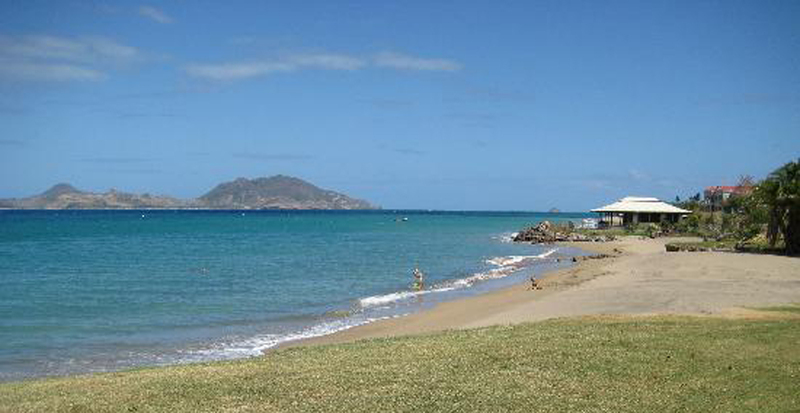 Nevis nice! !